Snowboarding first was included in the Winter Olympics in 1998 at Nagano, and in the sport’s five appearances, competitors from the United States have won 24 medals, 10 of them gold. Two of the golds came from the sport’s marquee figure, Shaun White, expected to be back for his fourth Olympic appearance at PyeongChang. 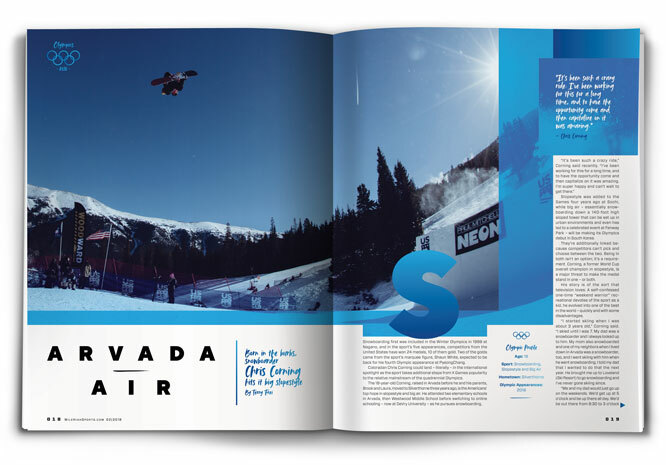 Coloradan Chris Corning could land – literally – in the international spotlight as the sport takes additional steps from X Games popularity to the relative mainstream of the quadrennial Olympics. The 18-year-old Corning, raised in Arvada before he and his parents, Brook and Laura, moved to Silverthorne three years ago, is the Americans’ top hope in slopestyle and big air. He attended two elementary schools in Arvada, then Westwood Middle School before switching to online schooling – now at DeVry University – as he pursues snowboarding. Slopestyle was added to the Games four years ago at Sochi, while big air – essentially snowboarding down a 140-foot high sloped tower that can be set up in urban environments and even has led to a celebrated event at Fenway Park – will be making its Olympics debut in South Korea. They’re additionally linked because competitors can’t pick and choose between the two. Being in both isn’t an option; it’s a requirement. Corning, a former World Cup overall champion in slopestyle, is a major threat to make the medal stand in one – or both. His story is of the sort that television loves: A self-confessed one-time “weekend warrior” recreational devotee of the sport as a kid, he evolved into one of the best in the world – quickly and with some disadvantages. “I started skiing when I was about 3 years old,” Corning said. “I skied until I was 7. My dad was a snowboarder and I always looked up to him. My mom also snowboarded and one of my neighbors when I lived down in Arvada was a snowboarder, too, and I went skiing with him when he went snowboarding. I told my dad that I wanted to do that the next year. He brought me up to Loveland (Ski Resort) to go snowboarding and I’ve never gone skiing since. He took off from there. “When I was competing at 12 and 13, those kids had coaches and were living up here and had coaches from the time they were 7,” he said. “I came in on the scene with my dad and just kind of had fun and did contests and were together all the time. My dad was scared to go in the tent, though, because he didn’t have the coach’s credential. So I was always in there alone. He was at the bottom when I got done. He watched people and we did as much as we could without knowing a whole lot. Eventually, with his potential to be one of the best in the world becoming apparent, his parents made a bold move. Chris did some training in Silverthorne and lived there in short stints, but the family moved to Silverthorne full-time three years ago. Brook commuted to his mechanical engineering job in the Denver area. Laura worked as a court transcriptionist. At first, Chris trained in Silverthorne and then with the Aspen Valley Ski and Snowboard Club after his coach moved. A powerful performer – and make no mistake, performance is what slopestyle and big air involve, with height and degree of difficulty of the moves figuring into the judging – the 5-foot-8 Corning has taken a somewhat revolutionary approach by lifting weights five days a week. He’s up to 165 pounds. That’s behemoth territory in snowboarding. “Going to the gym is something I think is very important,” he said. “I weigh a lot more than a lot of these kids. They can keep up and do these tricks, but I think sometimes I can bounce back faster. But, too, they don’t take as heavy of falls as I do because they’re lighter. Power and being super-explosive comes from being in the gym, spending lots of time working on that stuff and knowing you have to have good amplitude coming into these jumps because it’s so important in judging, especially in big air.